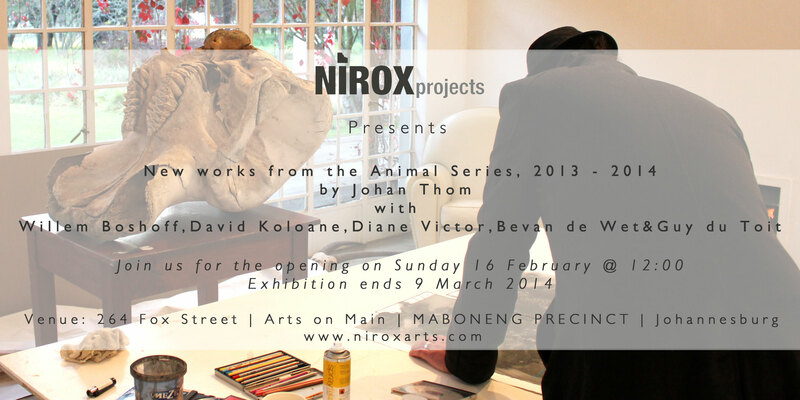 Nirox Projects at Arts on Main presents a new series of works from the Animal Series by Johan Thom. Central to this series of works is Thom’s ongoing investigation of his own material encounter with an African elephant skull. The exhibition is divided into three bodies of works: etchings; drawings and sculpture. 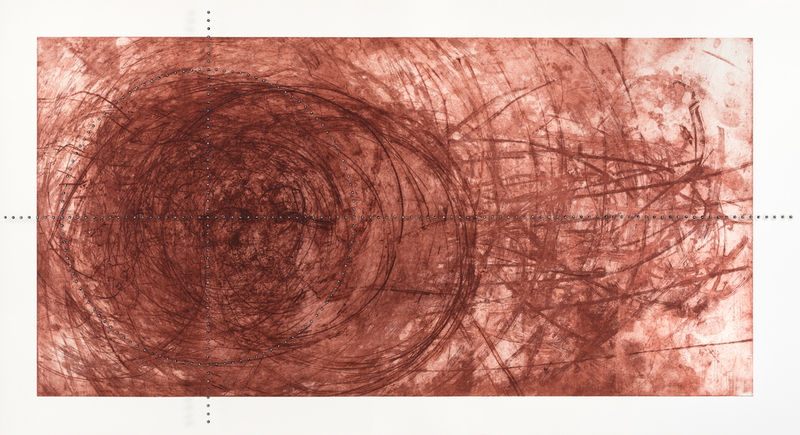 Over the period of eight months Thom produced a set of five large-scale etchings in collaboration with Willem Boshoff, Diane Victor, David Koloane and Bevan de Wet. In collaboration with Thom, each artist was invited to create an aesthetic response to the elephant skull: Thom would first work on the plate by for example making a full body print or scratching the plate’s surface with the elephant skull. After this, the plate was given to the collaborating artist to work over and layer by adding further marks, visual or conceptual elements, drawing from the encounter with the elephant skull. 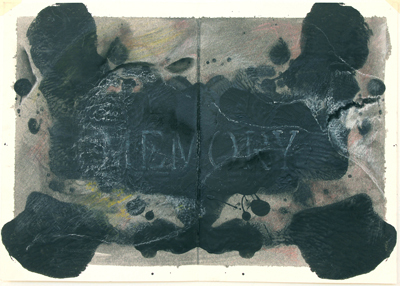 The exhibition also includes a set of charcoal and mixed media drawings that remind of Rorschach patterns. These observational drawings appear almost ghost-like in their rendering of the three-dimensional shape of the skull in shades of white upon blotches of ordinary blackboard paint. 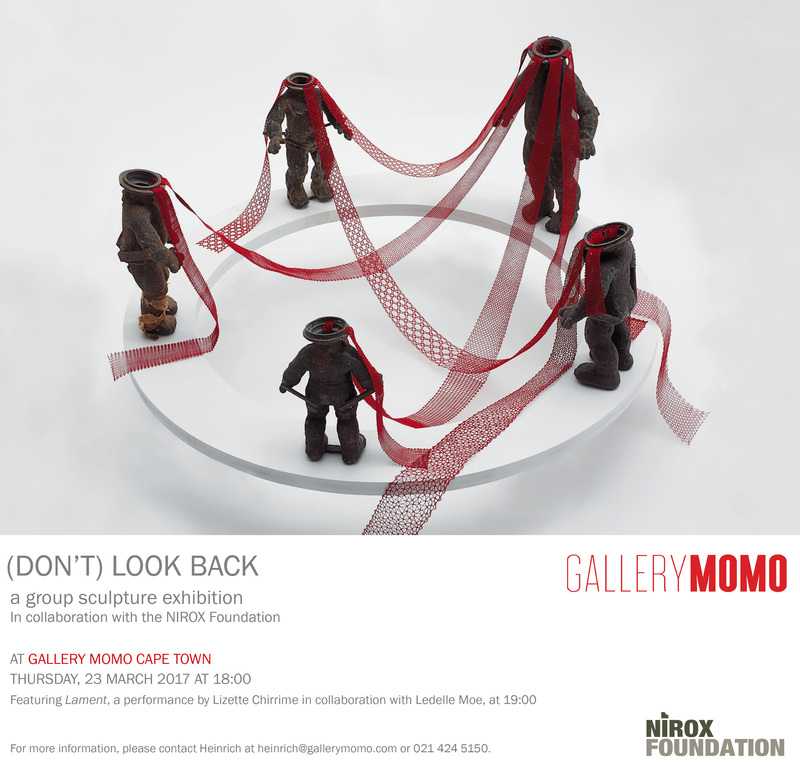 Also showing as part of this exhibition is a bronze and mixed media sculpture produced in collaboration with Guy du Toit. The artist wishes to thank the Nirox Foundation for their generous support throughout this project and the Artist Proof Studios. 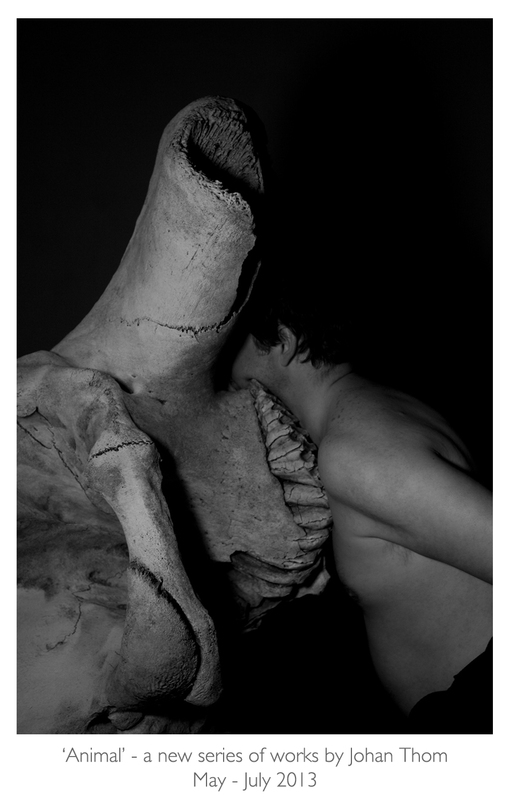 Johan Thom, on residency at the Nirox Foundation (http://www.niroxarts.com) from May – June 2013, is producing a new series of works around the theme of an elephant skull. For the etchings/ printing project four large-scale etchings of approximately 2m x 1m will be produced in collaboration with some of South Africa’s most prominent artists (Willem Boshoff; David Koloane and Diane Victor). According to the Artist’s Proof studios, this may well be the largest project of its kind ever in South Africa. Apparently I have a work on this exhibition… should be a very interesting show regardless of whether you spot it or not*. ‘Dada South?’, curated by Roger van Wyk and Kathryn Smith presents a collision of artistic strategies and forms that reflect the impact of Dada; works conceived and enacted in the spirit of Dada, and which seek to question the conventions, values and function of art in a troubled society. The juxtaposition of works from South Africa and from abroad, aims to examine the significance of non-western cultures in Dada practice. It also provides an opportunity to consider an alternative history of resistance in a culture of isolation and repression in South Africa, one that intersects with the canon of ‘resistance art’, but which deviates into forms that are less didactic, more eclectic and experimental. On exhibition will be historical Dada works and publications by Marcel Duchamp, George Grosz, Raoul Hausmann, John Heartfield, Hannah Höch, Man Ray, Hans Richter and Sophie Täuber-Arp are assembled for exhibition alongside works and objects by Jane Alexander, Walter Battiss, Willem Boshoff, Candice Breitz, Kendell Geers, Neil Goedhals, Wopko Jensma, Robin Rhode, and Lucas Seage among many others. 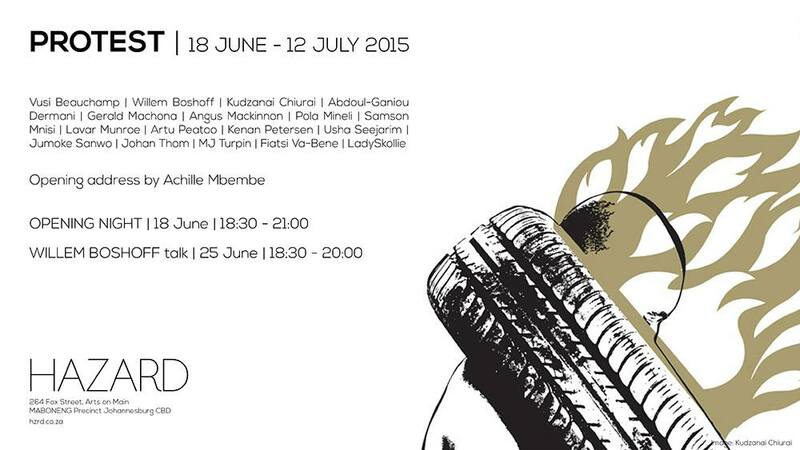 The opening features a series of performances by Warrick Sony, Donna Kukama and Kemang wa Lehulere and the Iziko Museums Education and Public Programmes, among others.